Checkboxes will appear on every relevant page in OASIS. Some New Title related actions will not be available via bulk actions and will only appear to the action arrow for now. The Retain and Remove from list functionality has changed. Users will no longer see options to “Retain on List” and “Remove from List”. It is recommended that a user save titles to a list prior to processing for selection or ordering from Shopping Cart or Authorize orders. Now actions (i.e. Select Now, Order Now, etc.) have been changed. Select Now has removed and replaced with Express checkout in the Action arrow and is now available as a bulk action when using the checkmark boxes. Items selected are still retained in your Sent to Ratifier list. Order Now is still available in the Action arrow and is replaced by Express checkout in the bulk actions when using the checkmark boxes. With the new checkboxes and bulk action buttons, there is no longer a need to use “Mark for …” actions or the “Mark All” and “Process List” buttons in the upper right which have now been removed. Edit order info… (replaces Order Info) and has been cleaned up to allow for more intuitive actions. “Delete” has been changed to Remove. Reject request (replaces “Send to Recycling Box”) sends titles to a user’s Recycling Bin. The first example below applies to items that are ordered. The second example below applies to items that are forwarded or moved to a list. When using List/Forward in the action arrow for a single title the checkbox for “Show Order Info” has been changed to Add order info before sending and moved to the bottom right of the pop-up. Now, if you wish to add order info when using the List/Forward bulk action function, first apply the order info changes via the Edit Order Info bulk action button then click the List/Forward button to complete the action. If logged in as a ratifier users will also see a new Download option in the bulk actions. This new will allow the user to download a MARC but this action does not initiate or place an order, nor does it add an updated status message to the browse row or history. To order a title use the Express Checkout button. With one click (using the checkboxes), users “check” or “uncheck” an item(s) for action. The “Mark for” language has been removed. As soon as a box is checked, bulk options now appear at the top of the results or list. Once you have checked all desired titles for a specific action, then with one click, choose the action, such as “Add to cart” or “Express checkout”. No more “Process List” with multiple clicks to finish the process. For single title selection a few actions will remain in the green Action arrow but can also be done using the checkbox and actions across the top. As previously mentioned we will also retain New Title-related bulk activities (i.e., Add to DDA) in the Action arrow for now. Edit Order information is now easily accessible in the row of bulk actions across the top. The bulk action Edit Order Info can be used for a single selection or for multiple checked items. This was formerly referred to as Order Info and is also still available in the action arrow but for single title selection only. The fields within the single and multi-line order form template have not changed but the form actions have been simplified. The new Edit Order Info button which appears at the top of the screen when a checkmark is placed next to a title is where any bulk order information actions are taken. Order information will be added to all checked items. 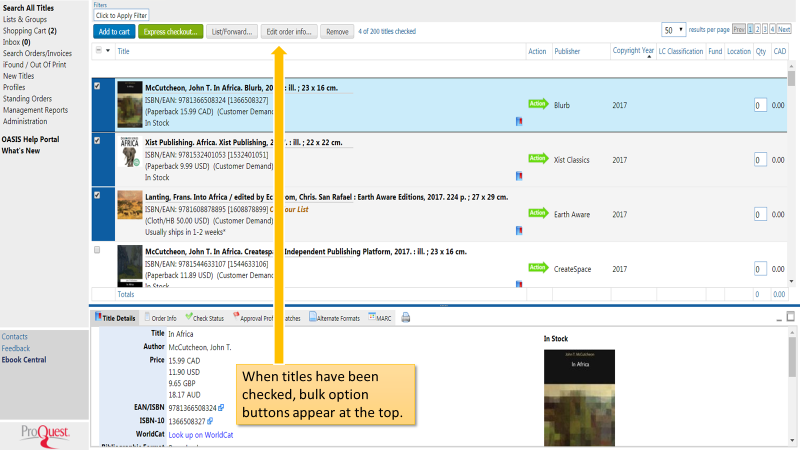 The number of titles selected is displayed in the upper right of the form. The Overwrite checkbox plays an important role when adding the same information to all selected titles when there is any existing information to be replaced. When the box is checked all fields will be replaced. The Save and Cancel buttons are now prominently displayed in the top right. It is important to note that Edit Order Info in the Action arrow does not allow for bulk actions. Selectors can easily add single or multiple items to a Shopping Cart using Add to Cart. Express Checkout can be done on bulk selections as well as individual title selections (formerly Select Now in the Action arrow). 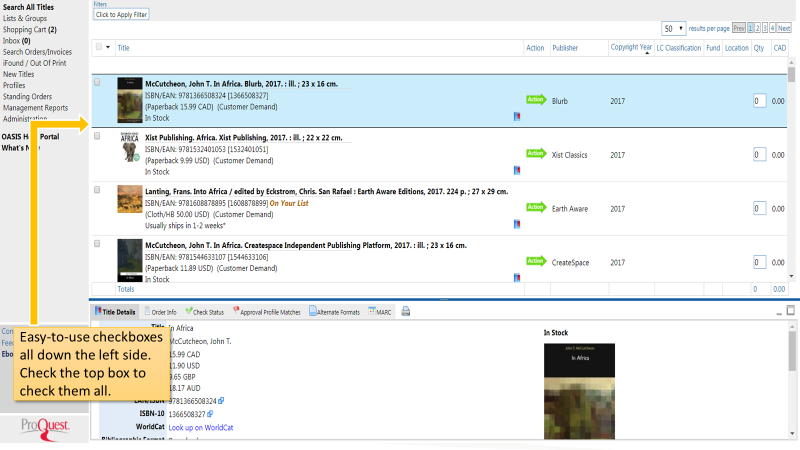 List/Forward allows users to checkmark a single or multiple titles and add to a list all at once. This option is also still in the green Action arrow for a single title action. Reject Request is a feature that replaces Send to Recycling box but has a similar meaning in that it sends items to the Recycling Bin. This will display as a status in the selectors Sent to Ratifier folder – allowing transparency when something has not been ordered. The new Remove button replaces the Delete Now. With one click (using the checkboxes), Ratifiers “check” or “uncheck” an item(s) for action. Or, using the top box all items will be checked. The “Mark for” language has been removed. If the list is ready to go choose the bulk action, such as Express checkout. If Express checkout is selected and mandatory order fields are missing you will see the following message before the order can be complete. A pop-up listing the number of titles to be processed and the Ratifier’s check-out setting. No more Process List with multiple clicks to finish the process. 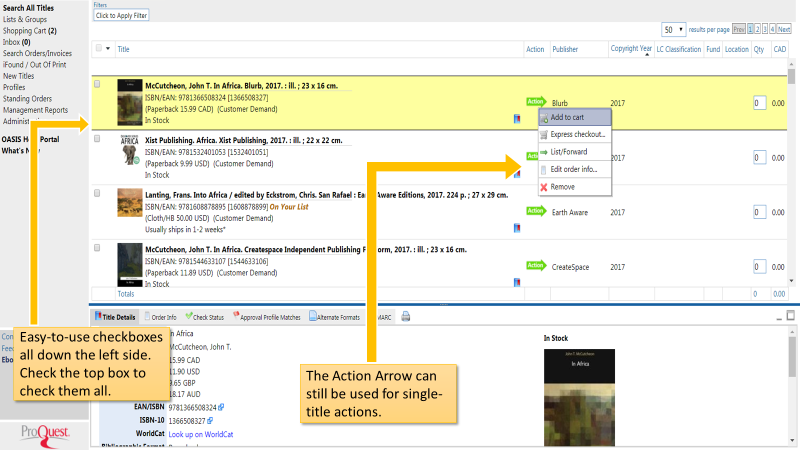 For single title selection a few actions will remain in the green Action arrow but single title actions can also be done using the checkbox and bull actions across the top.